These new powdered enamels are just what the Doctor ordered. They are a line of intermixable opaque enamels that can be used on just about any glass. They are ideal for work on float / window glass as well as 90 and 96 fusing glass. They mature at bending temperature (1175 F - 1400F) so they can be applied and matured during a slump firing. The best thing is - they are lead free. Try them - you'll like them. For decorative glass only! Not for food bearing surfaces. 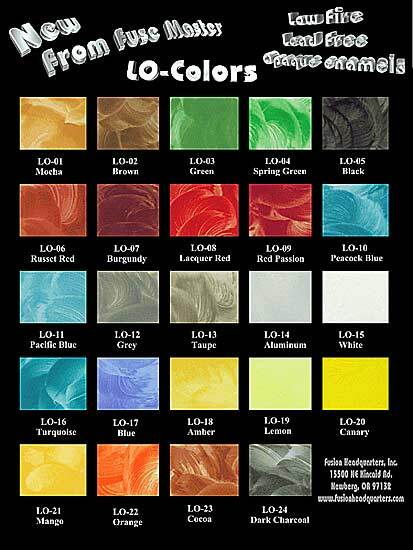 To get a more exact reference on how the LO enamels look after they are fired onto clear window glass, download this chart (730Kb PDF) and print it on high quality photographic paper with your printer set at its best printing setting.